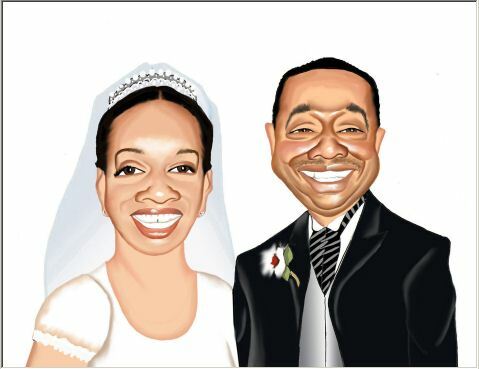 A popular use of caricatures is to draft the bride and groom and to use the caricature in an element of the wedding. Some use them as date savers, others as the cover for the wedding invitation. This couple will be using theirs as a wedding wedding sign-in board. What a great way to gather best wishes from your guests and to include it as part of the overall art work. It is quite simple – all you have to do is make sure you have a nice wide mat inside the frame where people can write. Then after the wedding it is simply a case of replacing the glass for a lasting memento of the happy occasion!! And yest we love feedback from our clients! You have been wonderful and I LOVE this picture now. I will definitely be using it for the wedding. I will tell everyone I know how accommodating and professional you and your company have been. I will send anyone who is looking for a caricature your way.